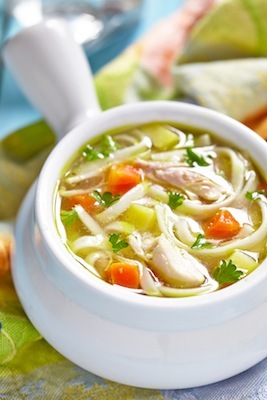 Here are a few of our favorite and easy chicken soup recipes. Great for a family dinner meal. Peel and cut ends off of carrots. Cut into 3 pieces. Cut celery ribs in half. Cut onion in quarters. 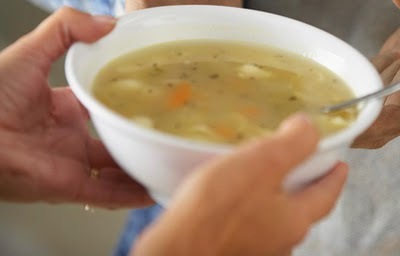 In a large soup pot, add roast chicken, carrots, a quartered onion, 1-2 celery leaves and bay leaves. Cover with water and bring to a boil. Cook and simmer on medium-low for 1 hour. Drain broth and reserve. Allow chicken to cool slightly and shred. Add another carrot, diced and whatever vegetables you'd like to the broth. Stir in egg noodles and simmer until vegetables and noodles are tender. Add all ingredients to a soup pot and simmer until tender. Add all ingredients into soup pan and let simmer until rice is tender and vegetables are done. * If using brown rice, cook brown rice before adding to broth. Or add brown rice to chicken broth, simmer, then add vegetables. It will take longer to cook and the vegetables will get too mushy but the time the brown rice is cooked. Try substituting barley or beans for rice. 2 chicken breasts cut up into small chunks. 1 medium onion, peeled, chopped finely. Boil the chicken chunks in your chosen stock for 20 minutes until tender. Whilst the chicken is cooking add the peas, carrots and celery and stir. Add the rice and green peppers and continue cooking for another 5 minutes. Add the tomatoes, curry powder and tomato purée and simmer for a couple of minutes. Season the soup and simmer for 30 minutes. When finished serve and enjoy!! Drain juice from canned chicken into pot. Add the can of chicken broth and butter. Bring to boil. Whisk together cornstarch and milk. Add to boiling broth. When this begins to boil, cut biscuits into about 6 pieces each and drop into the pot. 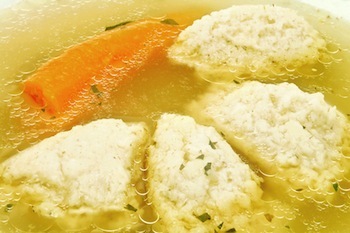 Reduce heat to medium-low and allow to boil until dumplings are fluffy. Add the chicken. 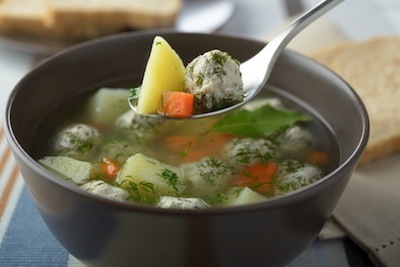 Combine turkey, egg, bread crumbs and parsley and form into meatballs.In saucepan cook broth and add carrots. Bring to a boil and add pasta cook 5 minutes. Lower heat and add meatballs. Simmer until cooked through. Boil a large pot of water, then stir in noodles until al dente. 8-10 minutes. Drain noodles and divide into 2-3 serving bowls. Boil chicken broth, mushrooms, and green onions in a saucepan. Cube chicken or tofu, and add to chicken broth. Bring to a boil again, and add egg whites by pouring them slowly in a ribbon. Stir in garlic powder. When the eggs are cooked, pour the soup over the noodles in the soup bowls, and enjoy!! Pour the chicken broth into a saucepan. Stir in the Italian seasoning and garlic. Bring the mixture to a rolling boil over high heat. Stir in the chicken and macaroni. Bring back to a rolling boil then reduce the heat to medium low. Cook for 8 minutes or until the macaroni is tender the chicken is cooked. Stir in the peas and green onions. Cook the soup for 2 minutes or until the peas are cooked through. 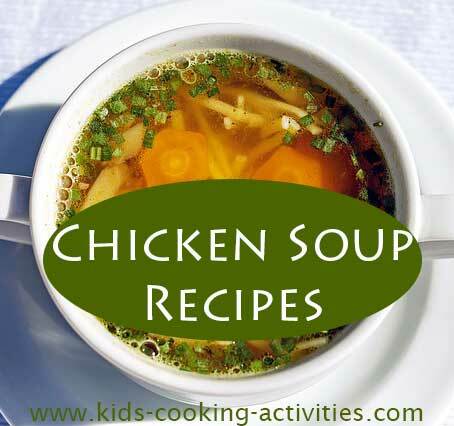 Do you have easy chicken soup recipes to share?